Oil and Gas Development Company OGDCL Jobs 2019 has been announced and they invited the application form from the candidates who are eligible for these jobs. If your are eligible then you must apply within due dates. After the due dates application form will not be accepted. 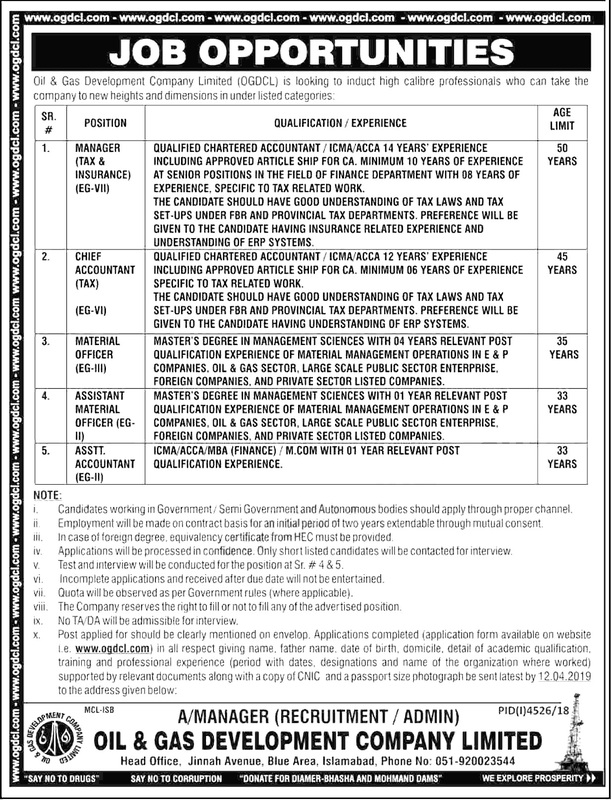 Oil & Gas Development Company Limited OGDCL is looking to induct high calibre professionals who can take the company to new heights and dimensions in under listed categories. Post applied for should be clearly mentioned on envelop. Applications completed application form available on this website gotest.pk, in all respect giving name, father name, date of birth, domicile, detail of academic qualification, training and professional experience period with dates, designations and name of the organization where worked supported by relevant documents along with a copy of CNIC and a passport size photograph be sent latest by 12.04.2019 to the address given. Candidates working in Government; Semi Government and Autonomous bodies should apply through proper channel. Employment will be made on contract basis for an initial period of two years extendable through mutual consent. In case of foreign degree, equivalency certificate from HEC must be provided. Applications will be processed in confidence. Only short listed candidates will be contacted for interview. Test and interview will be conducted for the position at Sr. # 4 & 5. Quota will be observed as per Government rules (where applicable). The Company reserves the right to fill or not to fill any of the advertised position. No TA/DA will be admissible for interview.